★Easy To Use and Install- This smart plug connects with internet via wi-fi network. No Hub and subscription required, just plug it into an outlet, and connect a device to the smart plug, then wirelessly control home appliances. Each smart plug only match one devices. ★Enjoy Your Smart Life- Only need WiFi control and download free app【ETMars】,support many kinds of device management: ON/OFF control, time/delay/ remote/voice control, share device, scene switch/linkage. ★Double Protection to Guard Your family- Use highly elastic phosphor bronze material, better contact, safer, not easy to fire, plug in thousands of times, not fatigue. with V0 fireproof industrial-grade PC materials ,prevent scratches, discoloration. Protect you and your family. ★Set Schedules and Timer- Just move your fingertips and you can schedule the smart plug automatically to turn on or off the electronic devices such as light, humidifier, etc as your need. ★ 100% Service and Guarantee - We are happy to provide full satisfaction with our Wifi Smart Plug. 30 days product replacement or refund if you are not satisfied. Buy with confidence! 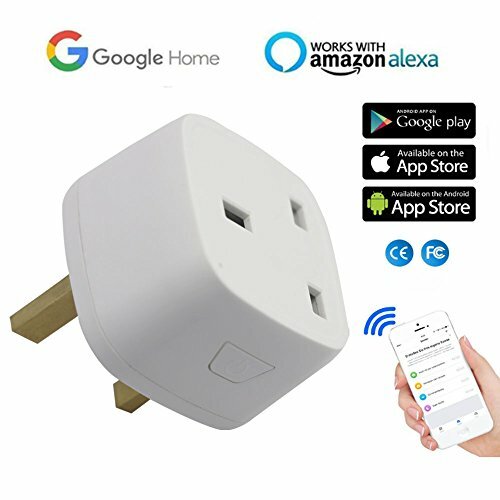 Very small compact smart WiFi plug. 2.4Ghz only.